Portugal’s Ageworthy White Wines and the Cinderella Myth – GARGANTUAN WINE. But, I'm a vintage old! I'm no good anymore! Two Portuguese regions are dominated by granite: Vinho Verde and the Dão, and each produce stunning whites. And yes, even Vinho Verde makes terroir-driven wines that can age. Vinho Verde is the land of acid surprises, and below are only a few examples of what you can buy without flying to Lisbon for fairly absurd prices. VINHO VERDE: THE NEW RIESLING? Refreshing 9.5% ABV wines used to be the unique dominion of off-dry Riesling. But modern Vinho Verde has a lot up its sleeve, and is a woefully underestimated competitor to Riesling’s crown for summer refreshment. There is a historic basis for the Cinderella myth. Vinho Verde (say it like you’re Portuguese: veeng-yo vaird) does not mean ‘green’ wine; ‘verde’ instead refers to young wine, as most wines were released 3-6 months after harvest. They’d typically still have a characteristic spritz leftover from their malolactic fermentation. For some time mass-produced co-op wines were to be enjoyed within a year to 18 months of release, and this is what many consumers learned. But nowadays, this is patently wrong in so many cases, and is one of the things holding wine lovers at bay. The are now at least two different Vinho Verde wines on the market. More modern iterations of the ‘traditional’ off-dry Vinho Verde still contain residual sugar (8-11.5% ABV), but ally it with cleaner and more proper winemaking and characteristic acidity; these wines can age much longer than folks imagine. Second: not unlike Riesling, many Vinho Verde wines are now vinified dry (to between 11.5 and 13.5% ABV) and offer stunning minerality and intense, refreshing citrus acidity. These are most often single varietal wines (as we’ll see later). But, in the interest of completeness, let’s explode this ‘Vinho Verde Cinderella myth’ right away. A PRINCESS … OR MAID IN TATTERS? 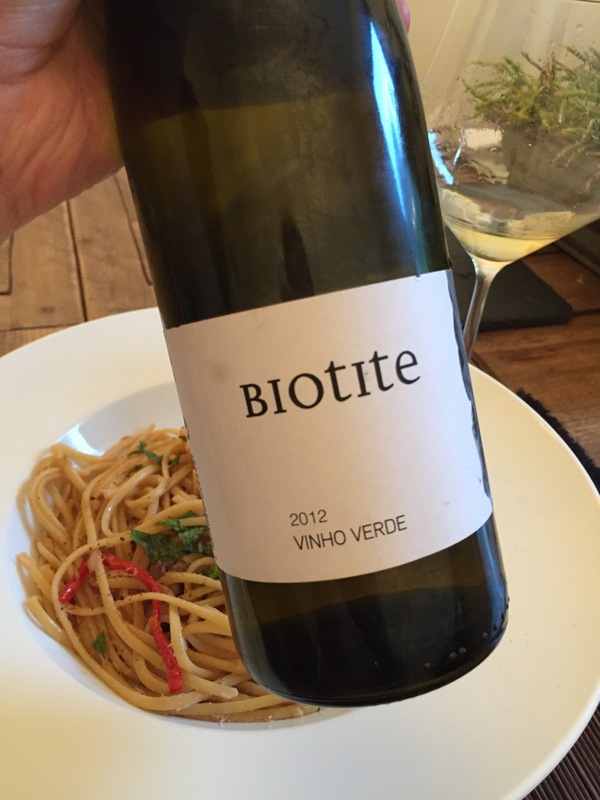 Here’s what should be a maid in tatters: a 2012 Casa de Mouraz Biotite Vinho Verde, now 3 years after vintage release. However, this particularly well-made Vinho Verde, from the first biodynamic producer in Portugal Casa de Mouraz, is not only still good, it’s singing. 2012 Casa de Mouraz Biotite Vinho Verde. The wine shows a flirty, luscious Chenin Blanc-style bruised pear skin aroma on the nose — a dead ringer for a Loire Chenin, really, with the tiniest green twinge; on palate, the age expresses itself as a slightly honeyed character, resulting in what feels like a honeyed lemonade with a piercing citrus that finishes almost like lemon sorbet, with what feels like an abundance of fresh, malic acid. The wine resembles off-dry Chenin for a reason: it typically has 15 grams of residual sugar, which it wears effortlessly, and which helps it excel with spicier foods. It was perfect alongside Linguine with Crab, Lemon, Chile, and Mint — a favorite in my house. The 2012 Casa de Mouraz Biotite Vinho Verde is 85% Loureiro, 10% Trajadura, and 5% Azal, and clocks in at a mere 9.5% ABV. Many winemakers note that as Loureiro ages, it sheds its floral character; to my palate, this wine is in an ideal place. Biotite, by the way, is a component of granite, found in sheets of dark mica crystals, which are found in this vineyard. So there you have it: gorgeous proof that well-made Vinho Verde is not some fleeting, fresh-cut flower that must be shielded from the cellar and bony hand of father time. Sara Dionísio of Casa de Mouraz agrees that their Vinho Verde ages quite well; even their first vintage of Biotite (2008) is still good, and just gaining in complexity, “ … a bit like an old Riesling”. 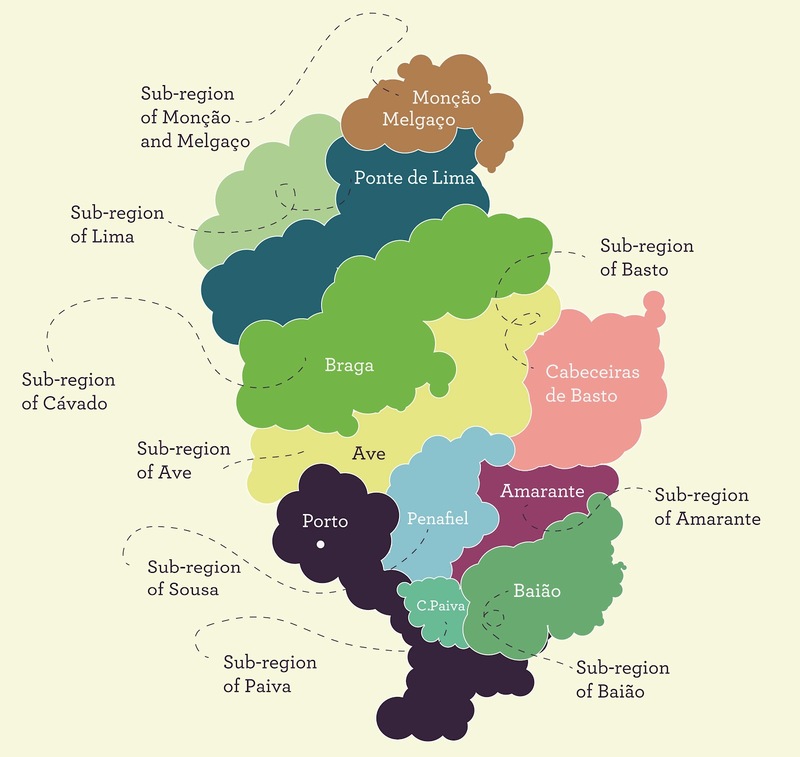 In order to sidestep consumer prejudice against Portuguese wine and Vinho Verde in particular, many producers now make single varietal wines and put the grape front and center, relegating both Portugal and Vinho Verde to the back label. Of the many unique, fascinating grapes in Portugal, only Alvarinho (aka. Albariño) will speak to international customers1. So far, just printing Alvarinho seems to be working. Many consumers think they’re drinking a Spanish wine (a subject of less abject prejudice). 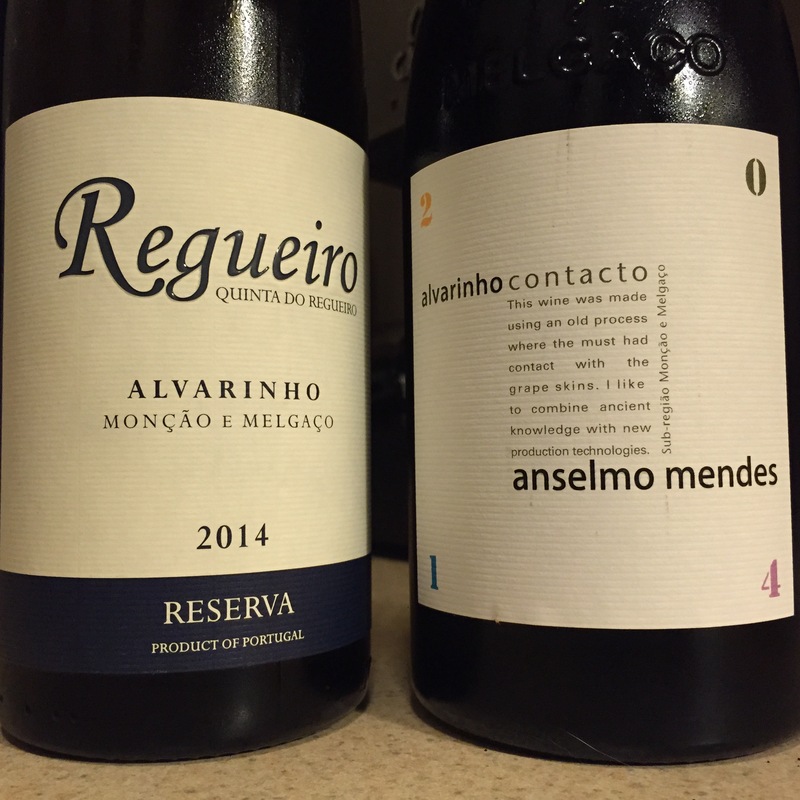 Here are two portraits of Alvarinho: the 2014 Quinta do Regueiro Alvarinho Vinho Verde Reserva, and the 2014 Anselmo Mendes Alvarinho Contacto. The 2014 Quinta do Regueiro Alvarinho Vinho Verde Reserva sets in with a nearly ripe yellow, peachy musk, with flecks of jalapeño and something akin to motor oil. Its briny, saline character peeks through on the accumulative finish, making this a winner for my palate, even if it is clearly pyrazine/green inflected. What an impeccable pairing to jalapeño yellowtail sashimi with yuzu soy sauce and cilantro! Its bright freshness is a saving grace in what would seem to be a year Regueiro picked early to avoid rain. Stony pyrazines, hmm; Sauvignon Blanc drinkers would quite predictably light up with joy. As the name implies, the 2014 Anselmo Mendes Alvarinho Contacto uses a short skin maceration after a total destemming of fruit; the nose offers a more candied peach and fennel, with bits of pickle juice (likely originating in the partial skin maceration). Its palate is denser, but some peachy powdered stone arrives to brighten things up. Its skin contact helps it play with food even more nicely, adding herbal notes. Each of these Alvarinhos will keep for 6-10 years in a cellar, surfing along on their acid structures. Still: it’s most often the blends which dazzle in Vinho Verde. Keep your eyes peeled for ‘Escolha’ white blends; the word escolha simply means ‘choice’ or ‘selection’ and often expresses a house style via blending. 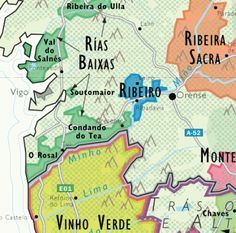 In the case of the following two wines, producers in Vinho Verde must instead call their wines Minho Regional wines, as they both include a forbidden fruit: Chardonnay. Quinta da Covela is a boutique producer who makes a lovely Escolha which I’m dying to find in the US market (the wines should become available in a couple weeks). As crazy as it sounds, they blend Avesso — a quirky variety which if bottled alone2 yields a fresh wine redolent of citrus and fresh, yeasty bread — with Chardonnay and Gewurztraminer. I quietly scoffed as they poured the wine once they had explained the varietals, but once I brought it to my nose, my jaw dropped. Here is a wine that smells like a lovely, salty stone! Must be well-made Gewurztraminer expressing itself. Only a bit of Gewurztraminer is present; allegedly a miniscule bit of Viognier makes it in, too. Each well below 15%, as this is primarily Avesso and Chardonnay, unoaked. All grapes are manually harvested, as machinery couldn’t handle the steep granitic terrasses. A stunning nose and a very alluring wine, a fortuitous result of Quinta da Covela’s previous owners’ bizarre penchant for planting international varieties during the late 80s. 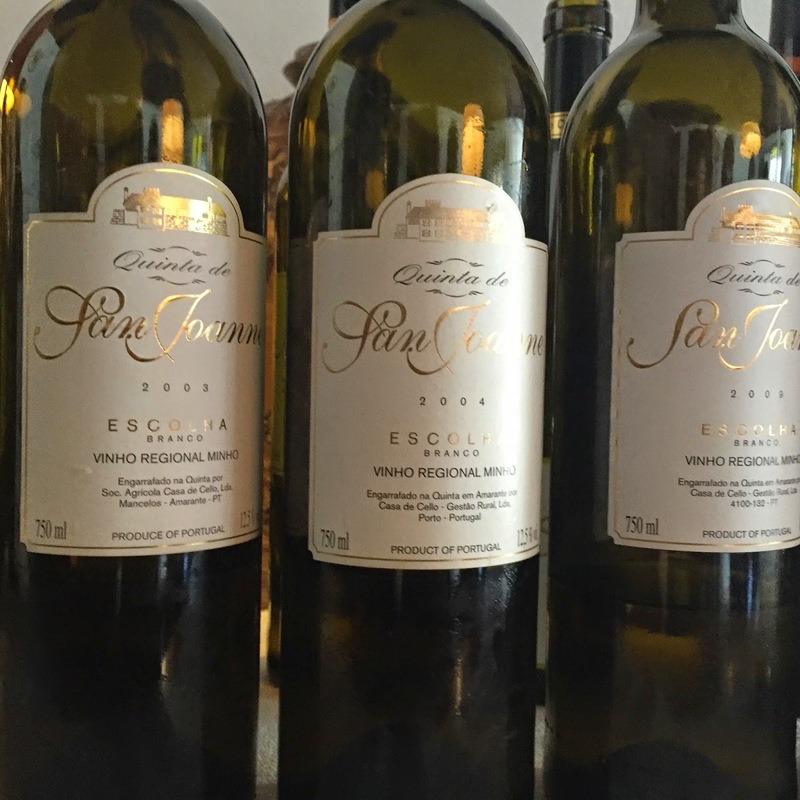 Quinta de San Joanne also makes an impressive Escolha 2013, a Vinho Regional de Minho, at only 11.5% ABV. The nose shows a tiny bit of ferment aromas that express themselves as a hint of glue; but behind that initial layer resides an amazingly potent, lean, puckered mineral nose. It shows the typical crushed stone aromas proper to these wines, as well as an amazingly acidic, citric finish. This is a more ‘conventional’ Vinho Verde blend of Avesso, Arinto, and Trajadura (aka. Treixadura) grapes, grown without irrigation, but this is partially stainless, partially oak fermented. And, once again: surprise, these wines can age well. A 2005 had aged into a nutty, corn and latex inflected mellow gold wine which still clung to its acidity and felt alive and fresh. Quinta de San Joanne Escolha whites can age quite nicely, thank you very much. I’m convinced Encruzado will grow in popularity, not simply because it can render stunning, ageworthy wines, but also because it’s fun and easy to pronounce: Encruzado. Sounds like Spanish for ‘crucified’. You may scoff, but trust me, Sancerre took off for a reason. The Dão is Portugal’s oldest wine region best known for its long-aging reds based in Touriga Nacional — that star of Port wine. You’ll recall the Dão and Vinho Verde are the only two regions in Portugal to be dominated by granite (the rest is schist). Encruzado is a grape that grows only in the Dão. Many local winemakers pretend it has no character of its own, and requires oak elevage to “flavor it” (gasp), but unoaked Encruzado actually has plenty of character when properly farmed and vinified. 2013 Casa de Mouraz Encruzado. Here’s proof. 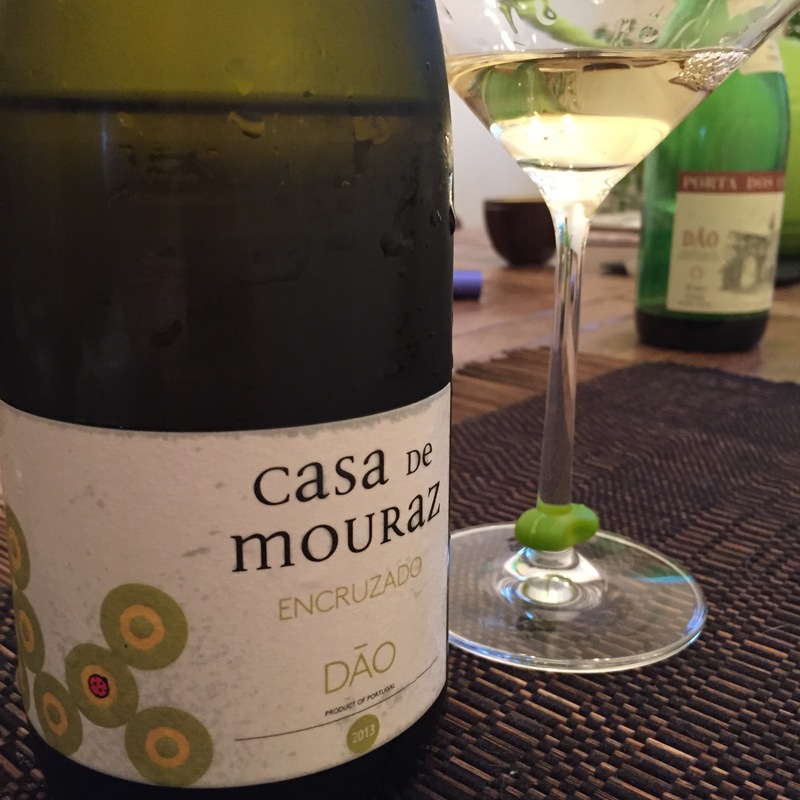 For less than $20, the Casa da Mouraz Encruzado is a biodynamically-farmed beauty that manages a seemingly impossible balancing act between heavily-etched tropical fruit aromas of shaved coconut, candied lemon rind, and pineapple, but ends with that bright acidity and an intense crushed granite nose and biting mineral finish. It begins alluding to stone fruit with air, but with a bitter, citric acid finish. The wine is as appetizing and refreshing as could be, more versatile with food thanks to its unoaked glory. The pro-oak school of Encruzado winemaking often does best with a divided approach between oak and stainless fermentation. Julia Kemper’s Dão white blend (50% Encruzado, 40% Malvasia Fina, plus ‘some secrets in my vineyard I never reveal’ — possibly Gouveio — co-fermented) is a half-oak fermented, half stainless-fermented luscious benchmark for the region, but may prove a bit more difficult to find in stores and cost closer to $25. You can age this into a fresh yet hazelnut beauty over 10 years, however, so consider that in your value calculus! 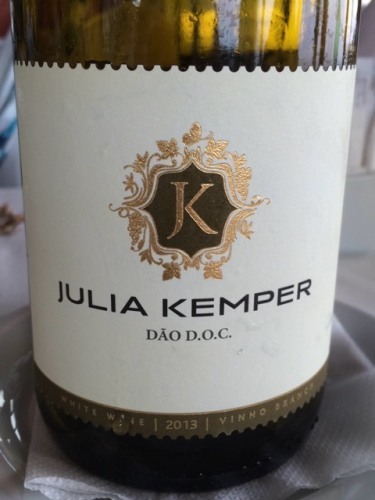 Julia Kemper Dao White 2013. Here is a regal wine that has won over countless wine critics, each of whom wonders exacty how Julia de Melo Kemper — one of 61 potential heirs to her aristocratic Portuguese family’s vines, who was the only family member to accept responsibility — manages to simultaneously run a legal practice and two vineyards located many miles away. Her ‘people’ as she dubs them, so instrumental to these wines (notably consultant winemaker João Paul Gouveia of Wines and Vines) are doing outstanding work for her; they have handed her an undisputed king of Encruzado. Even if there are similar fruit aromas to Casa da Mouraz’s unoaked Encruzado, Julia Kemper’s certified organic blend has a creamier midpalate attack, most likely due to partial new oak elevage (30% new French oak) and batonnage. But where many Encruzado done in oak fall flat — expressing more oak than anything else interesting — Kemper’s succeeds in a major way. Behind the refreshing crushed granite nose lies a custard pineapple aroma and texture that still manages to finish lean and bright with its acid character: that delightful cocktail of fresh, tangy citrus and crushed granite that marks each of these acrobatically balanced Portuguese white wines. Quinta do Paraíso bottles a monovarietal Avesso too. Good value. Aha! I guess Quinta da Covela isn’t the only producer then!